You would be hard pressed to describe music at Grace with one word. But perhaps eclectic is it. The music in our liturgies, on Sunday morning or at special seasonal services, is both uplifting and deeply grounding, drawing upon varied sources and genres from many traditions and across many generations.You will hear old hymns and new songs by composers from within our own community and from around the world. We sing songs – sacred music from prophets young and old – from the present day and from many years ago. Music is carefully selected to reflect the Episcopal lectionary, but not always predictably! Music is congregational and experiential, allowing for new understanding and insights into the retelling of our familiar stories. 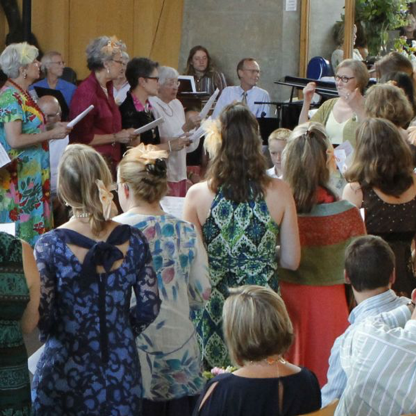 The Grace Music Circle is a multi-generational group of singers and instrumentalists who lead the Grace community in song every Sunday and for special liturgies throughout the year. All are welcome to participate. Rehearsals are most Wednesdays at 7 pm and again at 8:45 am Sunday morning. Kids of all ages sing regularly at Grace – with enthusiasm and great joy. Our songs are old and new, often inspired and suggested by the kids themselves! Younger singers, ages 4-10, meet to sing at 4:30 pm on most Thursdays during the school year. Middle school and high school singers and instrumentalists prepare special musical offerings throughout the liturgical year. Island Kirtan, led by Ann Strickland, is a sacred music ensemble practicing call and response Sanskrit mantra chanting. This practice is deeply meditative and quietly blissful! All are welcome – all ages, all faiths. Kirtan meets at 7 pm on the first Thursday of every month. Check the Grace calendar for the current schedule. If you have questions about any element of Grace's music program, contact Grace's Interim Music Director, Wendi Olinger.